Children need firm and loving direction from parents to help them find their way in life. But parents first have to know the way. 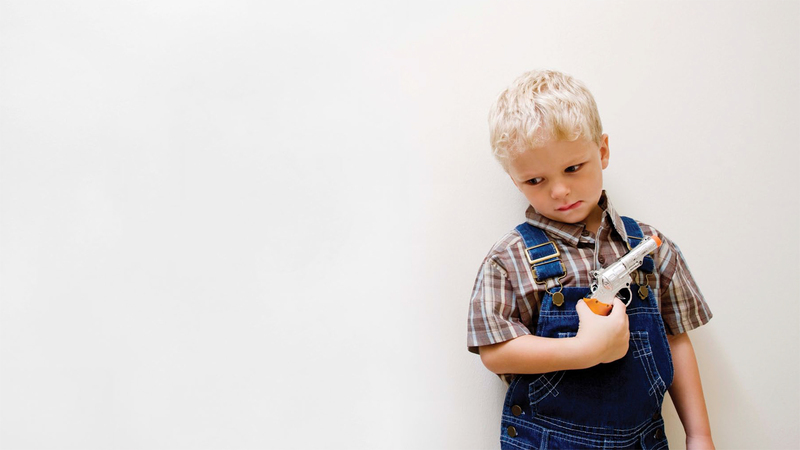 Could your child be on a path to violence? In 2000, the U.S. Secret Service National Threat Assessment Center conducted an investigation into 37 school shootings. Their interim report indicated that although there is no useful profile of the type of child involved, all the shooters had been on a path to violence. Since the perpetrators came from a wide range of family backgrounds and scholastic aptitudes, the problem could not be isolated to one particular social group or personality type. It appears that all children are vulnerable to the escalating problems affecting youth today. Accordingly, the character of our young people should be of major concern to us all. Any way we look at it, we have a crisis of ever increasing proportions on our hands when it comes to the development of children. Yet, although experts agree on the existence of the problem, they differ greatly in their approach to the solution. When the next generation demonstrates antisocial and self-destructive behavior, we have to accept that something is wrong, then find the problem and fix it. A society cast adrift from its moral moorings will have difficulty doing that. But until we individually accept responsibility for the culture that breeds such problems, the battle for the minds of our youth will continue to go against us. So what’s behind the failure Damon cites? Could the problem be that we have not transmitted standards because we no longer have a consensus on what to transmit? In an effort to inform legislators, policy experts and the general populace regarding some of these changes, former U.S. secretary of education William Bennett compiled the Index of Leading Cultural Indicators 2001. While acknowledging success in certain cultural areas during the 1990s, the report speaks clearly to the increasing breakdown of the American family. It says that during the 1990s, the out-of-wedlock birth ratio in the United States increased 18 percent, the number of families headed by a single parent increased 13 percent, the marriage rate decreased 9 percent, and the number of cohabiting couples increased 48 percent. This alarming trend is not confined to America. Data from the United Nations Statistics Division show an unprecedented rise in divorce rates in many nations around the world since 1960. We need parents who are prepared to stand firm against the cultural influences that have been, again in Damon’s words, “clearly for the ill,” and who will begin to take concerted, positive action in the development of their children. “The loss of family control,” says Damon, “is both perceived and real. . . . Between the confusing cultural relativism of modern times and the disquieting cultural wars of the present epoch, adults in our society have become uncertain about what are the ‘right’ prescriptions and proscriptions to impart to the young.” This uncertainty leaches into the community, the schools and the churches. The role of the family takes on even greater importance once we begin to understand the need for character development. Implicit in good character is morality. The cultural relativism Damon refers to in no way supports or encourages the morality that underlies sound character. As a result, character tops the casualty list in the culture wars. Where should parents begin in reclaiming their traditional role as authority figures and moral guides for their children? Clearly they have to be certain about what values they want to transmit to their offspring in the first place. Despite ongoing debates about the role media, schools and other external influences play in the behavior of children, those influences can be effectively countered in the home, where the development of good character begins. Society needs parents who are committed to the responsibility of providing a stable home for their children. But parents need to anchor themselves before they can provide a stable environment for the development of moral virtues in their children. Let’s face facts: our culture, our community with all its fragmentation and diversity of standards, will not of itself produce a child with sound moral character. Children need parents who are committed to living the moral virtues they want their offspring to develop. Yet contemporary society poses a problem. James Davison Hunter, in his book The Death of Character, puts it this way: “The desire to maximize personal interest and minimize personal cost in all of life’s arenas . . . is a moral commitment held unevenly but held by virtually all.” In other words, people are selfish. And if we live a selfish lifestyle, we can expect our children not only to mimic us but, with the pressure of cultural forces, probably to raise that selfishness to even higher levels. It is invariably true that the personal character and example of parents speaks louder than any verbal communication they may attempt. The first step in turning around the corrosive cultural climate affecting our homes is to address relativism. Our cultural morality says it is acceptable to produce children outside of marriage, engage in adulterous relationships, or simply pursue personal interests at the expense of family. We’re taught that while I might not choose to do what you’re doing, if it’s right for you, then it’s none of my business. Such relativism reduces truth to whatever we believe truth to be. Relativism sees the self as independent and free to choose its own standards within a loose social framework. This relativism is deeply embedded in virtually every institution with which our children will come into contact, including schools and even churches. Is this to say that such approaches cannot be turned around so that children can come under right guidance? Clearly not. There are ways out of the dilemma. First we must recognize that the logic of relativism, which says that morality is personal, fails when analyzed in light of the trickle-down effect of family disintegration. How we live our lives does affect others. Judith Wallerstein, an expert on the impact of divorce on children, offers this example: “Children learn all kinds of lessons at their parents’ knees, from the time they are born to the time they leave home. . . . [A] thousand and one images are internalized and they form the template for the child’s view. . . . [Children] observe their parents as private persons (when the adult thinks no one is paying attention) and as public persons onstage outside the home. . . . These complex images of parental interaction are central to the family theater and are of lasting importance to children” (The Unexpected Legacy of Divorce, 2000). The fact that our moral choices do impact others in the family is a truth that cannot be avoided. To protect the family, we need a moral code that does not hurt other people. Our moral virtues should provide a nurturing environment for those around us. The morality taught and upheld within families becomes the underpinning of social morality, since families are the fundamental unit of society. Flowing from objective moral truths is the manner or style in which children will have these virtues taught to them. What style of child training is going to produce the best results? Obviously all children are different and require parents to work with them accordingly, but in general the extremes of permissiveness and authoritarianism are best avoided. Child psychologist Lawrence E. Shapiro writes, “Researchers studying how parents react to their children have found that there are three general parenting styles: authoritarian, permissive, and authoritative. Authoritarian parents set out strict rules and expect them to be obeyed. . . . their emphasis [being] on order and control. . . .
“The permissive parent . . . seeks to be as accepting and nurturing as possible, but tends to be very passive when it comes to setting limits or responding to disobedience. . . .
“Authoritative parents . . . manage to balance clear limits with a nurturing home environment. They give guidance, but they are not controlling; they give explanations for what they do while allowing children to have input into important decisions. Authoritative parents value their children’s independence, but hold them to high standards of responsibility to family, peers, and the community” (How to Raise a Child With a High E.Q. : A Parents’ Guide to Emotional Intelligence, 1997). To achieve this balance, parents need a united approach so that children are not sent mixed or ambiguous signals as to what their limits are. Communication needs to be clear. Single parents must recognize that the absence of a partner only increases their child’s need for unambiguous moral instruction. Why is this important? Because we are surrounded by a sea of information, which, as already noted, is usually presented as a smorgasbord of relative truths from which we are free to choose. It is impossible for an adult, let alone a child, to sift through all the available information and separate the wheat from the chaff. Children need help to chart a course through this sea, and it is part of parental responsibility to direct the navigation process. Neither forced compliance with authoritarian dictates nor the softness of permissiveness will foster the understanding needed for a child to internalize a moral code that translates into good habits and high standards. Children need the kind of parental influence that instills that understanding. They need objective moral truths that are clearly spelled out so they can see the need to embrace them. Sound character requires that morality become a part of them, defining who and what they are. There is no need to reinvent the wheel: this kind of morality, where the good of others is placed above one’s desires for self, has already been established. A little time spent analyzing the deficiencies in the lives of our young, as pointed out by Damon, Bennett and others, yields some valuable insights. One is that the way of life taught by Jesus Christ supplies much-needed moral underpinnings that are relevant today. That way of life isn’t taught in schools, and sadly many traditional Christian institutions don’t understand it. It is the rejection of this morality that brought us to where we are now. Be what you want your child to become. Christ said that one of the reasons He came was to make the law of God and its principles even more applicable to human conduct. The fact that this law is now to be written in the hearts and minds of those who choose to subject themselves to God’s authority makes possible a profound change in human life. Is this not the same process we are attempting to instill in our children—to etch in their hearts standards of character that will guide them throughout their lives? God’s law is directed toward the good of others: “For this is the message that you heard from the beginning, that we should love one another” (1 John 3:11). The virtues that our families need in order to reverse the current well-documented trend of destruction are expressed in the Ten Commandments. Analyze each principle in turn and reflect on the fact that they collectively address what is required to rehabilitate the family unit as the foundational unit of society. Until parents turn to God’s law as the standard for their personal conduct and insist by loving instruction that these become the moral virtues of their children, we can expect family breakdown to continue, with all the dysfunction it brings. William Damon, Greater Expectations: Overcoming the Culture of Indulgence in America’s Homes and Schools (1995). James Davison Hunter, The Death of Character (2000). Lawrence E. Shapiro, How to Raise a Child With a High E.Q. : A Parents’ Guide to Emotional Intelligence (1997). Judith Wallerstein, The Unexpected Legacy of Divorce (2000).